It’s been a while since I blogged about any local food (a year ago in fact, with Summer Pudding) and the weather has turned chilly enough that I’ve had to get the fire going some nights, which is lovely and cozy. 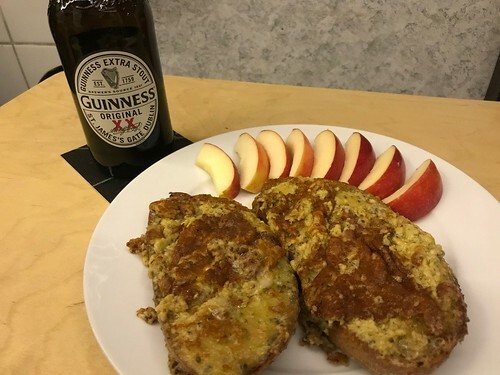 This, coupled with my now work-free lifestyle made it good time to contemplate a nice hearty toasty yummy treat like Welsh rabbit, which you sometimes see spelled “Welsh rarebit” even though it’s always pronounced “Welsh rabbit”. Note: No rabbits were harmed in the production of the blog post, largely because Welsh rarebit has nothing at all to do with rabbits. 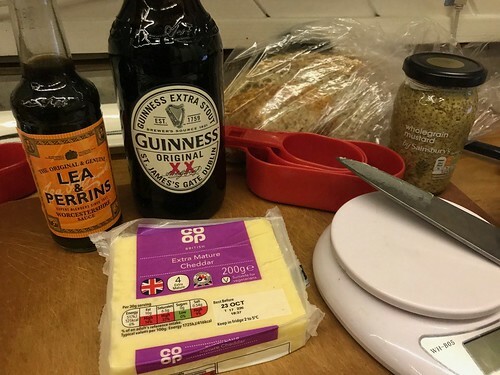 Welsh Rabbit is really just posh cheese on toast, and since I’m a big fan of cheese in any form I figured it was about time to test this out. This is despite the fact that toast is not really a boat-friendly foodstuff, because a conventional toaster draws about nine zillion watts of power, which is not healthy for one’s batteries. I do have one of those folding camping toasters to put on the stove, but it’s pretty crap. And it's possible to toast bread in the oven under the grill (broiler) but that’s not very fun, for reasons which will become clear below, which prompted this exchange between me and Karen when I was attempting to get her to tell me what food to stock up on for her recent visit. She’s flexible, I’ll give her that! Having a gas stove is great for cooking. Having a gas oven is better than having no oven at all, but not brilliant. Having a gas grill/broiler is the worst of the lot. Mine didn’t work for ages because some kind of thermostat thingy was broken when I first bought the boat, but I've had that repaired. Still, it’s a remarkably temperamental bit of kit. I have to light it with a BBQ lighter (though that’s true for the hob and the oven as well) and then verrrrrry gently release the gas knob, or it will go out. And then verrrrrry slowly close the door, or it will go out. And then when you put the food in you have to verrrrrry verrrrrrrrrrrry slowly open the door, or it will go out. And if you have to relight it the odds of it going out again spontaneously, or at any of the above repeated stages increases dramatically. Basically, you need to be a Grill Whisperer to actually achieve toasting, which is kind of ironic because toast is not exactly Cordon Bleu Level cookery. That’s why I have a general reticence about toasting on the boat. However, I also have a general love of things that are toasted, especially cheese, so what the heck, let’s dive in. The grill in one of its rare moments of actually producing heat. As for the Welsh connection, that’s pretty tenuous too and seems to boil down to something best expressed as, “Gosh those Welsh sure like their toasted cheese don’t they?” Wikipedia claims that "the notion that toasted cheese was a favourite dish irresistible to the Welsh has existed since the Middle Ages” and recounts a joke about St. Peter tricking all the Welshmen in heaven to leave by claiming there was toasted cheese just outside the Pearly Gates. Ho ho! What a merry jape! The distinctive thing about Welsh rarebit though is that it’s not just a lump of cheese on toast, it’s grated cheese mixed with other yummy stuff on toast and then melted all together. Let’s start first with the cheese, which should be a strong old variety, cheddar being the most common. The toast should be made from decent real bread that can stand up to toasting and then being smothered in yummy gloop without melting into pappy nothingness. 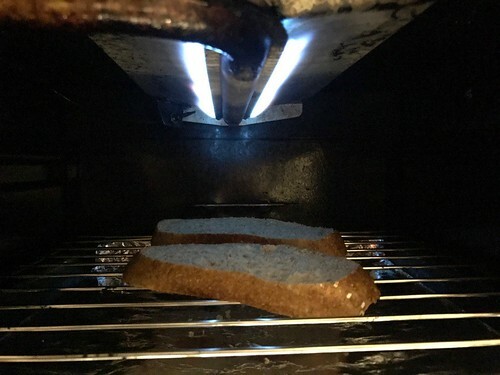 If grilling your toast (instead of taking the easy way out by putting a slice of bread into some sort of electrically powered device that heats it evenly on both sides at once) it’s best channel your inner Grill Whisperer and toast both sides instead of slacking off and only doing one side. What elevates the Welsh rarebit are the small additions to the grated cheese that loosen up the cheese mixture and add an extra kick of flavour. It seems to be generally agreed that some kind of liquid goes into the mix, with ale or other beer a popular choice. Mustard is also usual and Worcestershire sauce is mandatory. For the uninitiated, Worcestershire Sauce is in the orange labelled bottle on the left, and presents an even greater linguistic challenge that “rarebit”, being pronounced “WUSS-ter-sher” sauce, and originates in Worcestershire, obviously. Sometimes it’s even shortened to “Wooster Sauce” because the English like nothing better than leaving out whacking great chunks of words when they pronounce them. In the pantheon of typically English behaviours (alongside queueing, moaning and self-depracating humour) utterly ignoring three-quarters of the letters in a word is an area where the English perform effortlessly at an Olympic level. 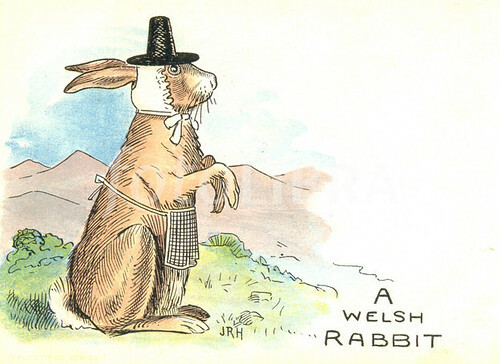 But back to Welsh rabbit. Here’s how I attempted to make it, with thanks to the Guardian recipes section. 1. Mix the mustard powder with a little stout in the bottom of a small pan to make a paste, then stir in the rest of the stout and add the butter and about 1 tsp Worcestershire sauce – you can always add more later if you like. Heat gently until the butter has melted. 2. Tip in the cheese and stir to melt, but do not let the mixture boil. Once smooth, taste for seasoning, then take off the heat and allow to cool until just slightly warm, being careful it doesn't solidify. 3. Pre-heat the grill to medium-high, and toast the bread on both sides. 4. Beat the yolks into the warm cheese until smooth, and then spoon on to the toast and cook until bubbling and golden. Serve immediately. 2 slices of chunky toast: I actually managed this! Even with the recalcitrant grill. 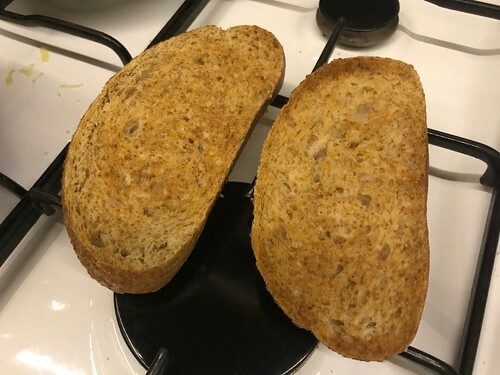 Photographic evidence of perfect toast, made on the boat. 1 tsp English mustard powder. Local grocery lacks powdered mustard so use a dollop of grainy mustard because I’m pretty sure that one recipe I read online somewhere mentioned grainy mustard. 3 tbsp stout like Guinness. No trouble. Tragically, the recipe uses a very small amount, so need to find another use for the remaining 26.3 tablespoons. 30g butter: Think to self, “This seems like an awful lot of butter for two slices of toast”. Use it anyways, because: Butter!! Worcestershire sauce, to taste: This ended up being a couple of teaspoons. 175g hard sharp cheese, grated: Again think to self, “This seems like an awful lot of cheese for two slices of toast.” Prepare a bit less, and use up random bits of cheese from the fridge including the end of a bit of parmesan. 2 egg yolks: Start separating eggs having carefully set out a dish for the excess whites, but no dish for the yolks. End up leaving each yolk nestled in half an egg shell perched precariously on the counter leaning against random utensils thinking, “This is going to end badly." 1. Mix the mustard powder with a little stout in the bottom of a small pan to make a paste, then stir in the rest of the stout and add the butter and about 1 tsp Worcestershire sauce – you can always add more later if you like. Heat gently until the butter has melted: Mix everything in the pan and think, “This is awfully wet looking." 2. Tip in the cheese and stir to melt, but do not let the mixture boil. Once smooth, taste for seasoning, then take off the heat and allow to cool until just slightly warm, being careful it doesn't solidify: Add cheese and think, “Yes, I was right, this is awfully wet. This is going to be like ladling soup onto toast. I’ll add the rest of the cheese." Add more cheese. 3. Pre-heat the grill to medium-high, and toast the bread on both sides: Success! 4. Beat the yolks into the warm cheese until smooth, and then spoon on to the toast and cook until bubbling and golden. Serve immediately: Beat the yolks into the warm cheese until still a bit lumpy and very very soupy indeed. Spoon onto toast and think, “Yes, this is exactly like covering toast in a very tasty cheese soup full of raw egg yolk.” Put it under the grill. Open the oven door to check and hear the grill go out. Relight the grill. See the grill go out. Swear. Relight the grill. See the grill go out. Swear a lot. Relight the grill. See the grill go out. Give up on the grill and light the oven. Gently warm the proto-rarebit in the oven. Spoon the rest of the cheese soup on top, because the initial covering has congealed enough to support another layer. Monitor cooking and decide the oven is just not getting the job done. Put both slices of toast, soup-side down, in a frying pan on the stove, thus perhaps inventing something called Australian Rarebit. You can really see the extravagant butter content start to show itself here. Sample the remaining 26.3 tablespoons of Guinness and cook until losing the will to continue and turning the whole mess out onto a plate. Jazz things up with a sliced apple, artfully displayed. Nevermind that the rarebit itself does not look precisely appetising. Remember how much butter and cheese were involved and tuck in. So I did eventually end up with warmed cheese on toast, though the process was arduous. If I ever attempt this again I'll probably need to outsource the toasting to save precious working grill time for the actual toasting of the cheese. Or perhaps I could make the toast the day before, to give the grill a chance to recover. (Though considering this is meant to be a simple and easy recipe, the need to prep a day ahead seems not entirely in the spirit.) And I'll use 90% less butter and probably skip the egg yolks or only use one, since I can't really see what they add to the party. It seems to me the irreducible elements of Welsh rarebit are: toast, cheese, mustard, Worcestershire sauce and a working grill. Perhaps those of you with toasters and working grills could do a bit of experimentation and report back. It's about time you lot started earning your keep anyway. 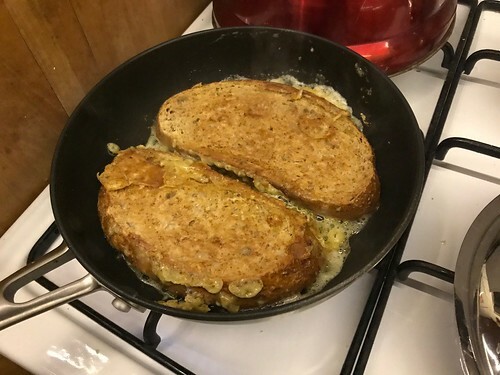 Thus ended my grand experiment in Welsh Rarebit, which I only embarked on because I thought it would be a quick and easy thing to blog about which then devolved into a messy, sweaty, sweary fight to the death with the grill. Thank God for the Guinness, that's all I have to say. It’s back to school time for most of these days, so I’m taking the opportunity to review a few words and phrases related to schooling over here. I’ll admit right now that I find the English school system mostly baffling with its A-levels and GCSEs and league tables and such, but it’s about time I got to grips with it so here we go, starting at the beginning. Primary School: Starts as early as age 3-4 with a year of Nursery School, which is followed by a year of Reception, then Year 1 (starting in the year a child turns 5), Year 2, Year 3 etc., up to Year 6 and lasting until age 10 or 11. For ease of understanding, this would be all the schooling you’d do BEFORE getting a letter inviting you to Hogwarts School of Witchcraft and Wizardry. At the end of primary school students will take SAT exams - the Standard Assessment Test, or an Eleven-Plus exam. 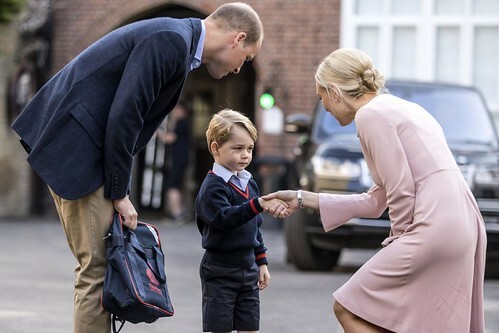 The media was abuzz this week with pictures of Prince William taking Prince George to his first day of school. Here they are, meeting the Headmistress of Thomas’s Battersea School, where the facilities include a ballet room, science labs, a pottery room, two libraries and a one-acre playground. The young prince, who will be known as George Cambridge, will get morning snacks of organic milk and freshly baked pain aux raisins, which is, with the addition of a shot of espresso, a lot like my morning snack. Eleven-Plus: An exam taken at the end of primary school used to determine admission to Grammar School. The exam was introduced in the 1940s as a tool for streaming children into one of three levels of secondary school (known as the tripartite system). Grammar schools were the most academically oriented stream, and, despite being re-tooled in the 1960s it was far more common for children from middle class backgrounds to pass their Eleven-Plus exams than for working class children. The Eleven-Plus exams are now less common. Most kids do a different standardised test that’s more geared towards assessing progress than determining if little Electra and Hugo will make it into a grammar school like St. Custard’s. League Tables: A system of ranking schools according to performance, partly based on students’ test scores in national standardised tests. Competition for rankings in the league tables can be fierce. This summer several grammar schools were accused of ejecting students for not achieving high enough grades, thus possible affecting the school’s all-important rank. Secondary School: Also variously called Upper School, College, High School blah blah blah. Covering ages 11-18, these are the Hogwarts years. You can spend them at a grammar school or a comprehensive, but odds are that wherever you end up you’ll be in some kind of school uniform. Tragically, almost no schools in the UK look like this. School Uniform: Most schools in the UK require students to wear a school uniform. 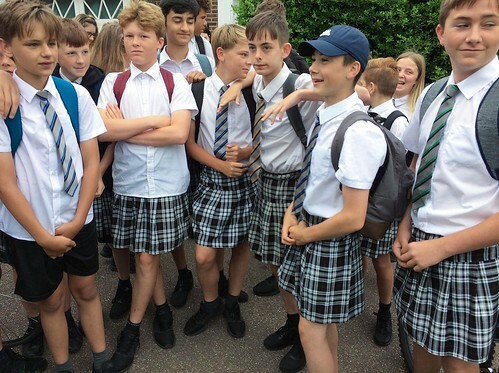 For the most part, schools have pretty simple uniforms, usually with black or grey trousers, plain white or light coloured collared shirts or polo shorts and plain black shoes, all without obvious school “branding”. (This is to keep the cost of uniforms as low as possible because often these standard items can be bought at many different stores, not just from the school.) The basic uniform is normally supplemented with a jumper and/or blazer in school colours, often with a crest, and a school tie. Some schools have particularly notable uniforms. There was one near the happy house in Brixton where the little girls wore blue gingham dresses and straw boater hats. Eton famously makes its boys wear a black tailcoat, waistcoat and pin-striped trousers, though they usually eschew the tophat these days. 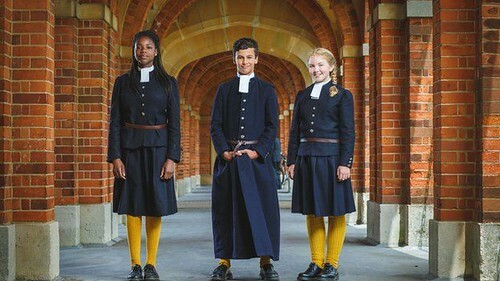 The prize, though, goes to Christ’s Hospital school, whose students wear a uniform first in fashion in Tudor times. Christ’s Hospital students. Rockin' the 16th century's hottest fashions. Jumper: The generic term for what in North America is called a sweater. You’d also call a fleece a jumper. Basically, any warm knit long-sleeved top is a jumper. Eton: (pronounced EE-tun, but please tell me I didn’t have to tell you that…) The oldest and most famous of England’s traditional boarding secondary schools, founded by Henry VI in 1441. Eton is a public school, which means it’s a private school. Go figure. Admission is selective and fees per year are in the neighbourhood of £36,000. 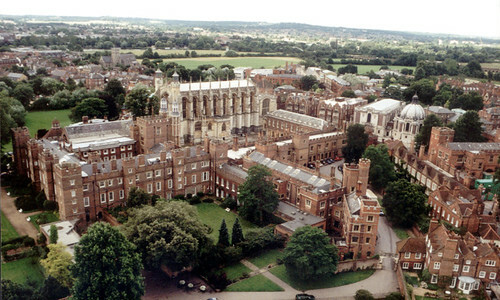 Eton is one of only four remaining public boys’ boarding schools. (The others are Harrow, Radley and Winchester.) The school has educated 19 British prime ministers and has been referred to as the chief nurse of England's statesmen. The Duke of Wellington is often mis-quoted as having said "The Battle of Waterloo was won on the playing fields of Eton.” Students are referred to as boys and on graduating become Old Boys, and, more specifically, Old Etonians. Eton College, which definitely has more than a faint whiff of Hogwartiness about it. Old Boy: The generic name for a former pupil of a primary or secondary school, and the literal basis of the Old Boys Club and Old Boys Network. Different schools have different names for their graduates, usually based on the name of the school, hence the Old Etonians, Old Harrovians (from Harrow), etc. To graduate and become an Old Boy (or just a plain old normal person who finished school) you’ve first got to contend with the GCSEs. 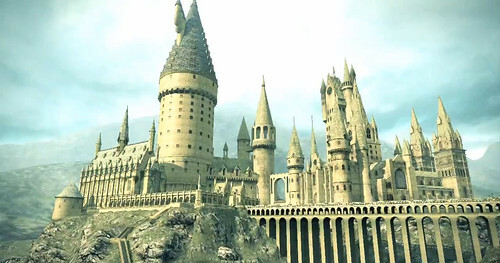 GCSE (General Certificate of Secondary Education): Equivalent to the Hogwarts OWLS (Ordinary Wizarding Levels), GCSEs are the last stage of compulsory education, taken in Year 11, at age 15 or 16. Every student is required to take the 5 compulsory subjects (Usually English Language, English Literature, Math, Science and a second language of their choosing). In addition, students choose five more subjects from a laundry list ranging from Astronomy to Motor Vehicle and Road User Studies to Divination. At the end of the school year students will sit an exam in each subject (and note that here in the UK you “sit" exams, not “take” them.) If they pass, they will earn a GCSE in that subject, so you’ll often hear people say things like, “I took a GCSE in Punjabi but I can’t remember a thing now.” GCSEs replaced the old O-Levels system, eliminated in 1988. Attaining a certain number of GCSEs at a certain level is a requirement for further study, which comes as A-Levels. A-levels: A Levels are subject-specific courses taken in the last two (optional) years of secondary school (Years 12 and 13, Age 16-18) commonly known as 6th Form. To complete our Hogwarts analogy, A-levels are like NEWTs (The Nastily Exhausting Wizarding Tests). Students choose how many A-Level subject to take. Most will choose three or sometimes four. I think my old housemate took six but we have already established that she is a clever clogs. The UK record is, I think, 11. The A-levels system means that students study their chosen subjects (and nothing else) intensively for two years. I suppose it's assumed you’ll take subjects that you’ll go on to pursue at university and as a career. Like taking an A-Level in Defense Against the Dark Arts if you want to become an Auror, obviously. A-levels are required for entrance to university, and your A-Level results will often determine whether or not you get into your university of choice, since students often have a conditional offer of acceptance from a university that will be contingent on them attaining certain grades in certain A-Level subjects, based on the course they’ve applied for. Clever Clogs: A person who is ostentatiously and irritatingly knowledgeable. A clever clogs will probably spend a lot of time revising. Revising: Studying, as in the thing you do when you’re getting ready for an exam, not they general practice of learning something. I find this a particularly odd phrase but it is universal. I’ve never heard someone here say “I’m busy studying for my A-levels.” It’s revising, in order to sit an exam, and then wait for Results Day. 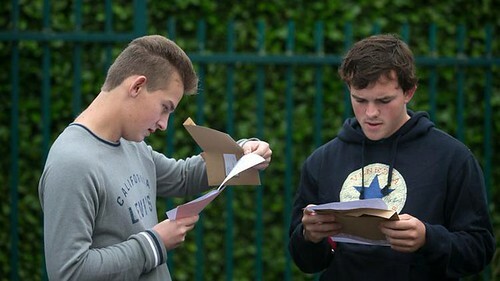 Results Day: The results for all GCSE and A-Level exams for all schools across the country are announced on the same day. (This year it was A-levels on August 17 and GCSEs on August 24.) Results Day generates a lot of sturm and drang and media attention and many photos of kids smiling or cheering or crying or all of the above because GCSE results determine whether you can go on to study A-Levels, and A-Level results determine whether you get into your university and programme of choice. If things don’t go as planned though, all is not lost. You can always try your luck at Clearing. Bad Haircut Guy: Uh Oh. This is not good. I needed an A in Modern Sanskrit and all it says here is "Must try harder". Or I think that's what it says. It's in Sanskrit. Blue Hoodie Guy: You’re screwed mate. It’s Clearing for you. Clearing: The Clearing process lets students apply for university courses that still have places available. This is for those who have not received any offers from a university, or (foolishly) rejected all their offers, or missed the conditions of their offers by sleeping through their A-level exams. Just like Results Day, Clearing is a huge topic in the media, with all kinds of guides to how to access the system and how lots of people have to go through clearing and still go on to lead fulfilled lives and how you should not panic because you’ve screwed up every chance you ever had of becoming a success and should probably just move to the Outer Hebrides except that you failed your A-levels in Salmon Husbandry, Peat-cutting, and Lard Cookery. I could get into the university level stuff here too - the Russell Group and Oxbridge and the Colleges system and such, but that feels like a different blog. Also I've just an enormous bowl of incandescently good bread pudding so what I really need now is a nap.